With Danish ice cream flavors lacking imagination, and the going rate for Ben & Jerry’s being around $10 a pint, a girl’s gotta take matters into her own hands. 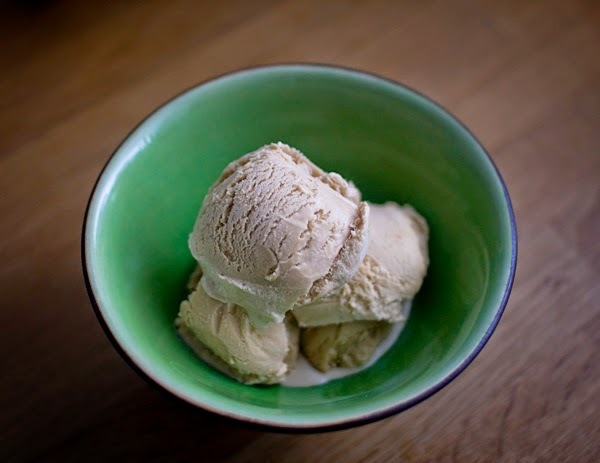 This is my homemade coffee ice cream recipe… just six ingredients, no cooking, and best of all… it’s Oik Approved*! Whisk the coffee into the milk and set it aside. Whisk the eggs for a minute or two in a large bowl, until they’re light and fluffy. Whisk in the sugar a bit at a time and continue whisking until it’s completely incorporated into the eggs. From a texture standpoint, it’s better to overwhisk than to underwhisk. Add the creams and the coffee mixture and whisk it for another minute or two, then process it in an ice cream maker for 45 minutes to an hour. This could not be easier or more delicious if it tried! I find it difficult to get the texture of homemade ice cream just right, but this one is a winner… it’s the whisking. **This is half and half in the States… you’re looking for something with around 10% fat. Thanks for that tip. When we had our own milk cows we used to sometimes make our own ice cream, but it never turned out with quite the right texture. Not likely to make it now.but may be one day? Interesting to learn that Danish folk might have boring ice cream preferences like me — here I’m an oddity! Yes, plain Jane even in ice cream. Vanilla… sorry. Yours looks great. I don’t mind vanilla from time to time… I’ve got some in the freezer that I’m planning to serve later with Creme de Mente! If you like licorice ice cream, they’ve got plenty of that… blech! Eeeew! Can’t even spell what I feel about that!